Will take you to the base of the yet unscaled virgin peak, Gangkar Puensum, Opportunity to soak in two of Bhutan’s most revered hotsprings, believed to have curative powers – the Gasa Hot Spring and Dur Hot Spring. Visit and see the grandeur of Gasa Dzong, a 17th century Fortress. Interact with the people of Laya and learn about their way of life. Beautiful landscapes, flora, fauna, culture. The first day of the trek will take you along a path made up of subtropical forests and through villages all the way till Gasa Tsachu (hot spring). Revered for its curative powers, hundreds of people from around the country throng this hot spring. You could take a soak, if you wish. After lunch at the hotspring, we ascend and climb up for about two hours to the camp for the night, located just below Gasa Dzong (Fortress). After breakfast, we will visit the Dzong, built in the 17th century to protect the valley from Tibetan invaders. We will then begin the day’s trek, which is an up-hill trail till Bele la pass (3,700m) traversing through outgrowths of bamboo, rhododendron, juniper and fir trees. The ascend till the pass will take around 5 hours. After that, we gradually descend for about half an hour to the camp at Chamsa. As we begin the trek to Laya, the path initially descends to the banks of Mo Chu River. After that, the trail ascends and then descends detouring back to the hillside, thus avoiding the steep climb. Lunch will be served at the side of a bridge across the river. After lunch, the gradual climb to Laya begins. We cross the army camp and arrive at Laya village, the camp for the night. Day 8: Rest day at Laya for acclimatization. This is a wonderful opportunity for you to get an insight into the lives of the Layaps (people of Laya). You can go around the village visiting houses and interacting with the people. The people are a friendly lot and will happily pose for photographs. In the evening, a cultural program will be organized. From Laya we descend to the army camp and continue our trek following the river till the turn-off point to Rhodophu, where we have our lunch. After lunch, we continue the up-hill trail traversing through rhododendron bushes until the camp at Rhodophu. Overnight at the camp. As it is the longest day of the trek, we start verly early at around 5 am. We climb up till Tsimola (4,700 m), the first pass. Once we cross this pass and arrive at a little summit, we can have a breathtaking view of Lunana, Mt Jomolhari and Mt Jitchu Drakey. For the next four hours, we walk along a flat trail, until we reach the summit of Gangla Karchungla, another pass (5,080 m). At the pass, we will be greeted with yet another spectacle of a range of mountains, including Masagang, Tsende Gang, and Teri Gang. It is an enthralling experience. After the pass, the path consists of a long descent all the way to Tarina valley, our camp for the night. It is a much easier trek as the path follows the river down the valley. Lunch will be served at the lowest point for today (3500 m). After lunch, we climb up about 300 meters to the village of Wache and camp for the night. The trail traverses through thick forests made of juniper and fir trees, before changing to rhododendron bushes. We then climb up to Kechela (pass) (4,480 m), from where we can have a great view of the mountains. Once we cross the pass, we descend to the riverside and trek through a village. We will be greeted with stunning views of Table Mountain and others. We continue following the river, one of the main sources of Pho Chu, till Lhedi village. The trek continues following the river and rising gradually to Choejong village. After lunch, we will visit the Choejong Dzong and then continue the trek, which takes us towards the wide valley. After crossing a bridge, we reach Thanza and camp there. Day 14: Rest day at Thanza. This is yet another day to relax and immerse yourself in the sights of the beautiful and stunning views offered as you walk around or climb up the ridge. The surrounding lakes and mountains paint a picture, which only a trek of this kind can offer. The trek starts with climb up to the ridge with great view of the Table Mountain and Thanza valley below. The ridge altitude is 4,500 m and rises gradually up to 4,650 m near by the Foot Bridge. After lunch walk up towards the left side of the bridge enjoying the views of the snow peaked mountains. Climb up ridge after ridge until you reach the camp at Tsorim at the altitude of 5,150 m. Then down to the camp at 5125 m.
This is the highlight of the trip and we start the day with a short climb to the Tsorim lakes. Walking by the side of the lake is an enthralling experience as you can also see the panoramic views of the Gophula ranges. The last climb to Gophola pass (5,230 m) is very short. After the pass you descend to the base camp, taking a short walk along the ridge, where the majestic and mighty Gangkar Phuensum awaits you. Day 17: Rest day at the base camp. 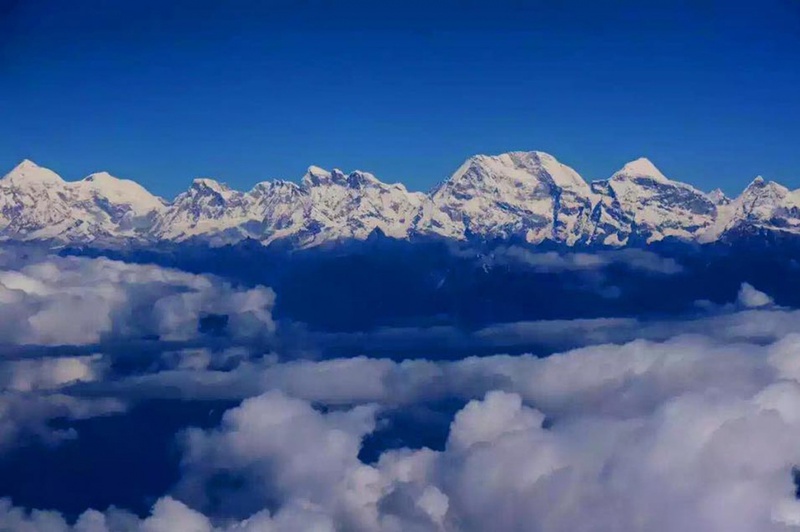 It is a day where you can relish enjoying the great view of Gangkar Phuensum and the glaciers. If you have the energy, you could divert towards the left side and climb up the Pyramid Peak for a better view. You could also go down to the base camp, which is nearby Sha Chu at an altitude of 4,970 m.
It is time to bid farewell to the beautiful mountains, but the trek is far from over. The trail follows Sha Chu and descends gradually to Geshe Woma, which is at an altitude of 4,200 m.
The first part of the trail continues along the Sha Chu for about two and half-hours, after which the stiff climb to Sakala (pass) begins. As visibility along the Sakala trail is poor, one must watch the top of the ridge for guidance. We will have lunch by the side of a yak herder’s camp. After lunch, we continue the ascend to Sakala pass, which is at an altitude 4,800m. Once we cross the pass, we descend and reach a spot with lakes. The trail again ascends till Wartangle pass (4,590 m), which offers a breathtaking scenery of small lakes and the mountain peaks. We camp at Warthang, which is at an altitude of 4000m. The trek begins with a short climb to Juelela pass (4400m). Once we cross the pass, we descend to a riverside and the trail traverses through dense forest composed of rhododendron, juniper and conifer trees. We will then reach a bridge. Once we cross it, the trek is again up-hill till Dur Tsachu (hot spring,) one of Bhutan’s revered hotsprings believed to have curative powers and associated with the 8th century tantric saint Guru Padmasambava. We camp for the night here. As our trek ends, we cross the last pass of the trip (Juelela pass). From the hot spring it is a long and steady up-hill trek, across ridges offering stunning views of the mountains in Lunana. Blue crystal lakes and yak herders’ camps will greet us until we arrive at Tshochenchen, our camp at an altitude of 3,850 m.
Day 22: Tshochenchen – Dur Jakar. It is the last day of the trek, and a boundary beyond which yaks will not move. So our gears will be carried by ponies. The path follows the Chamkhar Chu, descending gradually with occasional climbs. The trek ends as we arrive at Dur village, after which we drive to Bumthang and halt at a hotel.